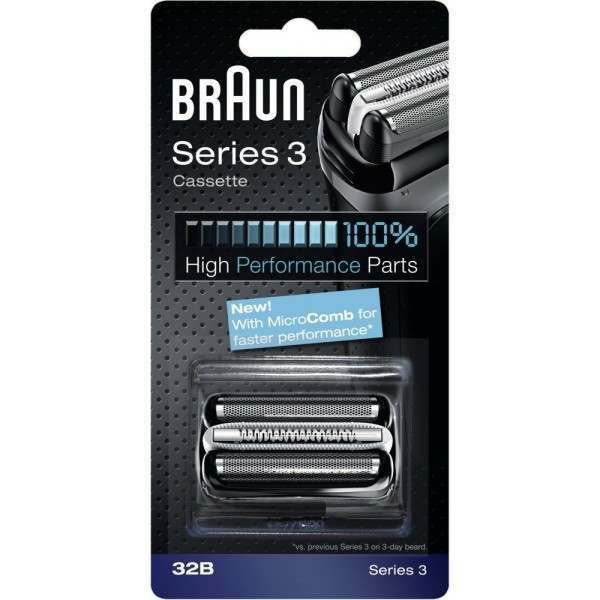 The Braun 32B replacement foil and cutter cassette is one of our most popular Braun foils and fits many of the Braun Series 3. Replaced approximately once every 18 months, a new foil and cutter cassette with ensure your Braun shaver gives you consistently excellent performance every day. The Braun 32B Series 3 Black Cassette Foil & Cutter replacement pack is a popular spare for replaicng the foil & cutter for your shaver every 18 months. The new MicroComb provides a faster performance. Very fast delivery. Item as expected. All good. Arrived next day on standard delivery. If/when I need more shaver parts I will order them from here. Great product ultra fast delivery the item is first class . and will use again well recommended. Excellent service, advised which one would fit and arrived next day. Will definitely use again.